With just 3 ingredients, this DIY natural all-purpose cleaner comes together in under a minute + it’s safe, effective and smells AMAZING! We’re back with another DIY homemade cleaning recipe! This time, I’m sharing one of my most used household cleaning products: a 3-ingredient DIY natural all-purpose cleaner. 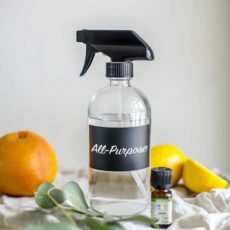 Why make your own all-purpose cleaner? 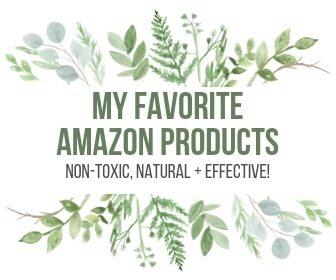 Just like we discussed why you should make your own beauty products in this DIY moisturizer post, most store-bought cleaning products are filled with toxic chemicals. Plus, it’s cheaper to make your own cleaning products and it couldn’t be easier. 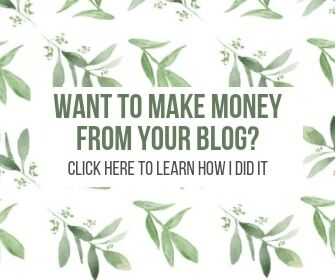 I used to be so intimidated by DIY projects, but after I got over my fear (and, let’s face it, laziness), I realized that these products come together in less than 30 seconds flat. 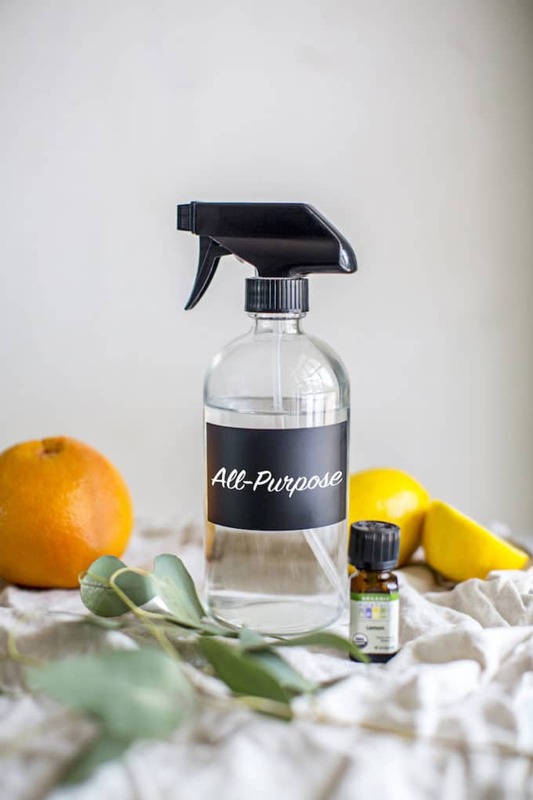 I made four other DIY cleaning products when I made this all-purpose spray, and in less than 5 minutes, I had completely made over my household cleaning closet with safe, natural, effective products. Boom! I always feel like the Grim Reaper when I write these stories, constantly warning you guys about the doom and gloom that’s found in most of our store-bought products. While I hate to always be the bearer of bad news, my hope is that a domino effect will occur that will ultimately result in companies changing their products to safer, non-toxic ingredients so that we can go into any store and trust that we’re buying products that won’t harm us. I write a story about the scary chemicals lurking in conventional products. I’m all, “this gives you cancer”, “this makes you infertile”, “this messes with your respiratory system”. Total buzzkill. 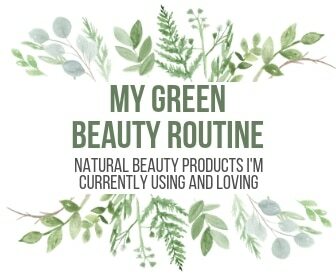 My dear readers roll their eyes, but slowly start reading the labels on the products they use and looking more into what these chemicals really are and what they can do to us, and our environment. Are you still with me?! Eventually, people stop buying those toxic products, voting with their dollars to send these companies a message. And maybe some quite literally send these companies a message asking them to stop using these harmful ingredients in their products. Or you write to your congressman and ask them to support bills that clean up our products, enforce stronger labeling and even ban the most toxic chemicals. 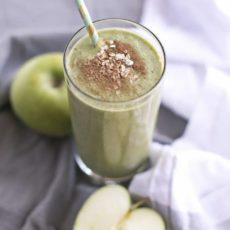 In the meantime, you try a few of my easy DIY recipes–realize how quick and simple they are to make, and how effective they are. You lessen your toxic load, make your home a safer place and live happily ever after. Eventually, these big brands get the message and change their ways, ultimately making transparent products that we can trust to be safe and sustainable. Still not convinced? 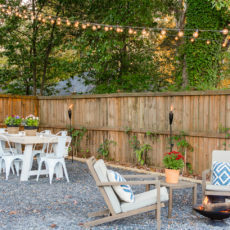 The EWG recently updated their cleaning guide and after analyzing over 2,500 household cleaning products, they found that almost half were rated “poor” and nearly 75 percent contain ingredients which may have worrisome respiratory health effects, particularly chemicals routinely found in all-purpose spray cleaners. Many are also known to cause developmental and endocrine harm, not to mention the negative impact they have on our environment. These chemicals are only partly removed by wastewater treatment plants, don’t readily break down, are persistent in the environment and toxic to aquatic life. Toxic Preservatives: Many household cleaners contain harmful preservatives, like 2-BROMO-2-NITROPROPANE-1,3-DIOL (formaldehyde), which are known to cause cancer and are extremely toxic to aquatic life. They can also cause severe skin burns and damage our eyes–not exactly the kind of thing I want to be spraying all over my house. Ammonium Hydroxide: Likewise, many multi-purpose cleaners contain ammonium hydroxide, which can burn skin, damage eyes, cause asthma and hurt aquatic life. Colors: Artificial colors are so toxic that the FDA prohibits the use of this substance in cosmetics because it causes cancer in rats. But somehow, these chemicals are still allowed into our homes. Just say no! Bleach: Also known as sodium hypochlorite, bleach is a common disinfecting ingredient that can cause severe burns and eye damage, not to mention it can cause asthma to develop in otherwise healthy people after frequent exposure to low concentrations. Don’t be fooled by marketing. Even the all-purpose cleaners marketed as being natural or green often contain toxic chemicals, like Scrubbing Bubbles Nature’s Source All-Purpose Cleaner and Simple Green Concentrated All-Purpose Cleaner, which are both chockfull of hormone damaging ingredients like fragrance, stabilizers like Sodium Borate, and cleaning agents like Lauryl Pyrrolidone. The latter even contains a chemical called 2-butoxyethanol, which the U.S. Environmental Protection Agency found causes red blood cell damage and hemolytic anemia in animal studies via inhalation, skin exposure and ingestion (the exact way humans would be exposed to the cleaner). Whatever you do, start reading your labels and researching the effects these chemicals can have. The EWG has a great cleaning guide–here’s a list of 127 all-purpose cleaners with ratings. They will likely surprise you! I couldn’t believe that it’s not even required by law that these companies disclose their ingredients. Please, never buy a product if they aren’t willing to tell you what’s in it. RED FLAG! Now for the good news! 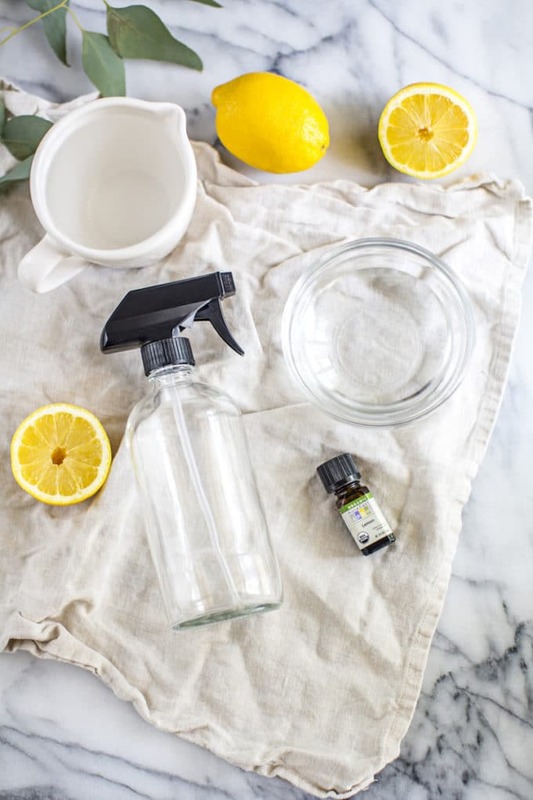 This DIY homemade all-purpose cleaner is not only super safe and natural (it only contains 3 ingredients, one of which is water!! ), but it’s super effective and smells AMAZING thanks to essential oils. I promise, the essential oils mask most of the vinegar scent, and even if any remains, it goes away after a minute. 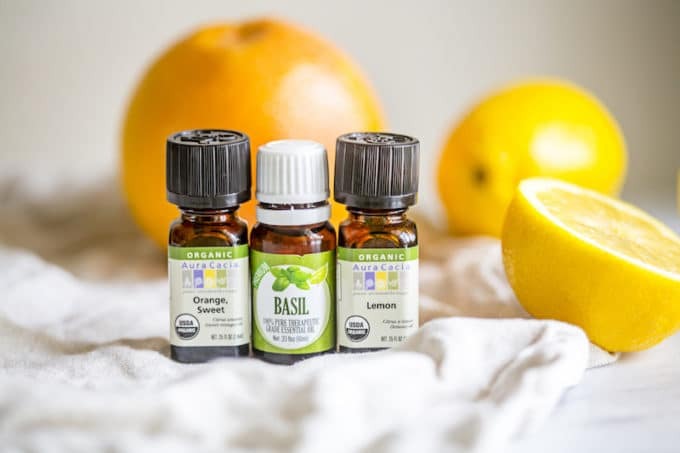 I recommend using crisp citrus oils like sweet orange, lemon or grapefruit or refreshing green oils, like bergamot, tea tree, eucalyptus and basil, which all smell super clean and even have antibacterial, antifungal, antiseptic, and germicidal properties. 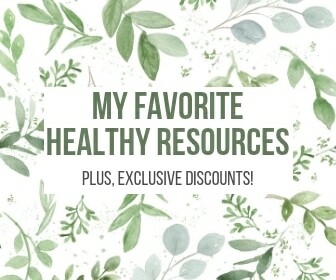 One of my favorite places to shop online for home supplies (and healthy food!) is Thrive Market. 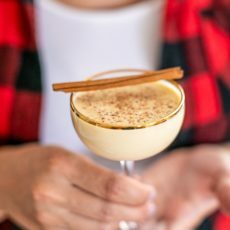 If you have a Thrive membership, you can order the essential oils you need for this recipe on their site – check out their essential oils collection here. If you don’t have a Thrive membership, check out this review of Thrive Market + Shopping List of My Favorite Buys! Just make sure you don’t use this on granite or marble countertops–the natural stone can be etched by the vinegar. But don’t worry, here’s a natural granite cleaning spray recipe. And in the meantime, you can use this multi-purpose cleaner on other kitchen and bathroom surfaces, cabinets, the inside of the fridge/freezer and some appliances. 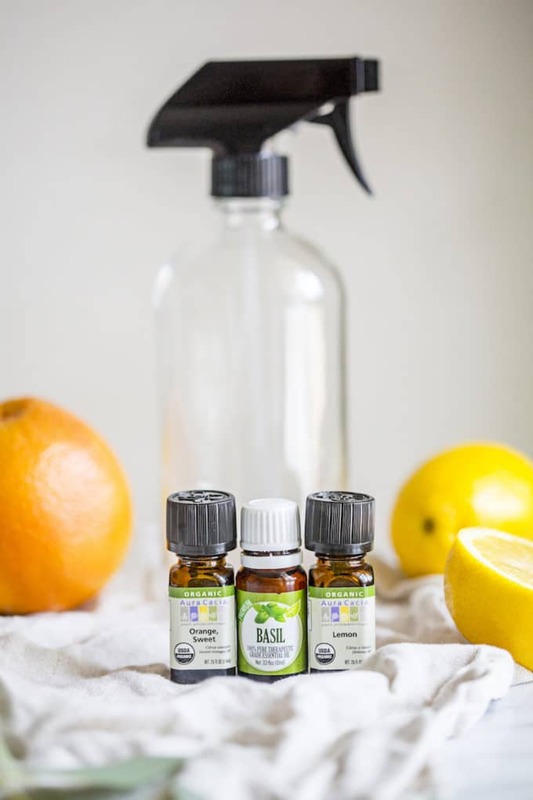 With just 3 ingredients, this DIY natural all-purpose cleaner comes together in under a minute + it's safe, effective and smells AMAZING! Pour all ingredients into a bottle. Fit with a spray top. Gently swirl the bottle to mix the ingredients together. Use immediately or as needed. Do not use all-purpose cleaner on granite or marble countertops as the vinegar will etch the natural stone. I recommend these glass spray bottles, which are the perfect size, pretty to look at and you don't have to worry about BPA in the plastic. find high quality writing like yours these days. I honestly appreciate individuals like you! I don’t refrigerate mine. I always use it up before I worry about the shelf life… with just a few ingredients I think it will last a long time, and if not, you should be able to smell it if it’s gone bad. Hi, just wondering if this would be OK to use on antique finished wood? I’m just afraid of leaving watermarks. Thanks! Hmm, I don’t want to promise anything just in case! But I *think* it would be okay! Can you test it on a super small/out of sight part of the wood first? Yeah, I’ll test it on a small area! Thanks! Cool. Let us know what happens! What’s the alternative you used? You could try using real lemons, for sure. I never have so I can’t speak to the efficacy, but it couldn’t hurt to try. Thanks for this stellar info! Will this work for dishes, as well as laundry? I’m looking for an all-purpose cleaner to use for everything (sorry if you’ve addressed this already.) Thanks! Hi, Lisa: No, this is really more for wiping down counters, but castile soap can be used for dishes and laundry and just about anything! Cut through the grime maybe even better than some of my favorite over the counter products. Thank you for giving me the motivation to make some additional changes in my home. It is just crazy what they can sneak into our products! I also like to save citrus fruit peels and add them to the bottle of my all-purpose cleaner. I find I can use less essential oil this way, while also reducing some food waste. PS – it’s no biggie, but the recipe is a little bigger than the bottle holds. I got the glass ones you suggested. It’s fine because I cleaned my counters, my microwave, and a bit of my floor where the cat had a hairball, and I’m pouring the extra solution into the bottle and it now fits. Yes! It’s okay on real wood. Thanks for letting me know about the size. Good to know that some users have a little leftover, I will make a note of that 🙂 Glad to hear that it works great!! Can this be used on floors? We have wood-laminate flooring, and I’d love a cleaner I knew was safe for cats and babies. I’m thinking if I mop mostly with water and some of this spray (I’m using something like a swiffer-wet mop), it shouldn’t harm anyone and get the job done, right? – baby stuff: wipes, ointments, etc. The stuff available out there scares me and I’m not even a mom yet! I saw one wipe recipe with paper towels, water and johnson&johnson, but I’m curious what you have up your sleeve. Can the all purpose cleaner be used on quartz countertops? I believe they are not as porous as granite. Do these cleaners kill germs? Do you use an all purpose cleaner for the bathroom also? Or do you make another DIY cleaner for that room? We have a septic tank. I want to be sure there aren’t any ingredients that might mess with it. Where exactly do I need to use castile liquid soap? Thank you so much for your time. Love this idea about making my own cleaners.